248 pages | 18 B/W Illus. This book maps a hundred years of documentary film practices in India. It demonstrates that in order to study the development of a film practice, it is necessary to go beyond the classic analysis of films and filmmakers and focus on the discourses created around and about the practice in question. The book navigates different historical moments of the growth of documentary filmmaking in India from the colonial period to the present day. In the process, it touches upon questions concerning practices and discourses about colonial films, postcolonial institutions, independent films, filmmakers and filmmaking, the influence of feminism and the articulation of concepts of performance and performativity in various films practices. It also reflects on the centrality of technological change in different historical moments and that of film festivals and film screenings across time and space. Grounded in anthropological fieldwork and archival research and adopting Foucault’s concept of ‘effective history’, this work searches for points of origin that creates ruptures and deviations taking distance from conventional ways of writing film histories. Rather than presenting a univocal set of arguments and conclusions about changes or new developments of film techniques, the originality of the book is in offering an open structure (or an open archive) to enable the reader to engage with mechanisms of creation, engagement and participation in film and art practices at large. In adopting this form, the book conceptualises ‘Anthropology’ as also an art practice, interested, through its theoretico-methodological approach, in creating an open archive of engagement rather than a representation of a distant ‘other’. Similarly, documentary filmmaking in India is seen as primarily a process of creation based on engagement and participation rather than a practice interested in representing an objective reality. Proposing an innovative way of perceiving the growth of the documentary film genre in the subcontinent, this book will be of interest to film historians and specialists in Indian cinema(s) as well as academics in the field of anthropology of art, media and visual practices and Asian media studies. 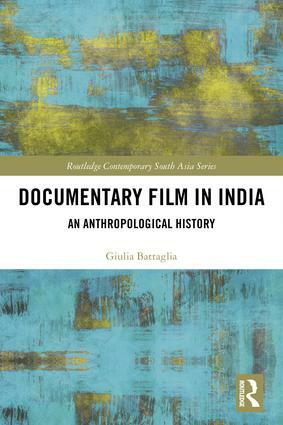 Giulia Battaglia is a researcher in anthropology of visual/art/media practices specialised in documentary film in India. Her work is interdisciplinary and draws from a range of academic fields, including visual/media anthropology, documentary studies, visual and material cultures, art and anthropology, Indian cinema, cultural studies and film history. After receiving a PhD from the School of Oriental and African Studies (SOAS), University of London, she has worked as a lecturer and researcher in various departments of anthropology, media, arts and social science as well as in cultural institutions in England and in France. At present, she lives and works in Paris in the field of anthropology, arts and media, being part of the laboratoire de recherche IRMECCEN, Université Sorbonne Nouvelle (Paris 3) and the laboratoire de recherche LAIOS/IIAC, at the École des Hautes Études en Sciences Sociales (EHESS). For the latter, she is also responsible for a funded international project between art and social science, called ‘L’invention des formes de représentation à l’ère de la mondialisation’.